Salaam Beautiful peoples, Google says the new redesign is available to all G Suite editions, and it will roll out to everyone over the next few days. The new Google Drive has no new big features, but it looks much cleaner now. Google recently overhauled Gmail with a fresh revamp and new functions. Now, the company is following that and rolling out an update to how Google Drive will look on the web. There is no change in the way you use Google Drive, the redesign just involves color changes and where icons and buttons are placed. Google says it made visual tweaks to Drive to align with its latest Material Design principles, which were already on show in the new Gmail. "We built this new interface to create a responsive and efficient experience for Google Drive users, and to feel cohesive with other G Suite products," the company wrote in a blog post. The changes include small adjustments to where icons are laid out: the settings wheel and help center button are now in line with the search bar; if you have a custom company logo, that’s been moved to the top right; the "NEW" button has been refreshed, and fonts for the headers have been changed. Google Drive’s background is also now white instead of gray. We are making some updates to the look and feel of Google Drive on the web. There’s no change in functionality, but some icons and buttons have moved, and there’s a range of visual tweaks to align with Google’s latest material design principles. We built that this new interface to create a responsive and efficient experience for Drive users, and to feel cohesive with other G Suite products, such as the recently redesigned Gmail. If you’ve added a custom company logo, it is now on the top right. The logo on the top left has been changed to the Google Drive logo. 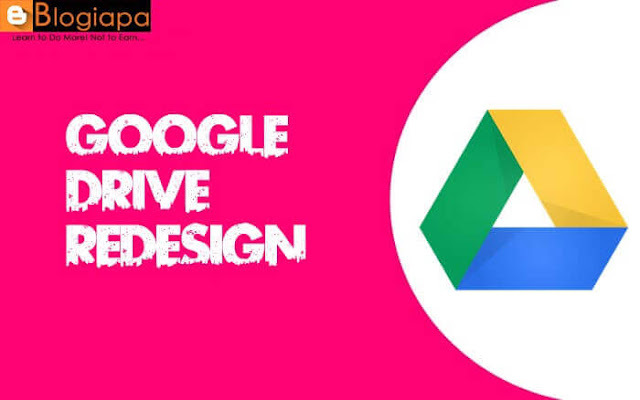 Google has given Drive a surprise makeover with elements that make it look more like the new Google Gmail. The redesign doesn't come with new features, but when you get it, you will notice that The Big G has changed the G-Drive interface background from gray to white for a cleaner look. Its boxes and icons now also have much-rounded corners and look a bit taller than before, and Google Drive's logo now has a more prominent place on the top left corner of the interface. You will also find that Google has shuffled Drive's icons around, with the Settings and Help Center icons now in the same line as the search bar. Google used to be well known for their lack of design skills, but over the years they have worked on improving the look of their services. This took a big leap with the introduction of Material Design and overall that has worked out very well as it has spread throughout the company. The design is never complete, though, and earlier this year we learned that Google’s Material Design guidelines were getting revamped. These changes have made its way to multiple apps and services so far, with Gmail’s latest update being the biggest example. This week the company announced Google Drive would be receiving a similar facelift and we are now able to get a look at all of the new changes. If you don't see the new elements yet, you will likely have to wait a bit before they reach your account. Google has already started rolling out the new design, but it will take up to three days before everyone gets it.